We are now using the SKYTRAK Launch monitor, which enables us to gain vital information for custom fittings. Enabling us to put the RIGHT club in your hand, so you can get improved results, INSTANTLY! You will soon be able to test out clubs and be custom fitted, all in store! We have a top quality hitting mat, installed by Grassify Marbella, and along with our Skytrak Launch monitor, will enable us to offer a first class fitting service. Performance is everything. And the better you clubs fit, the better you play. 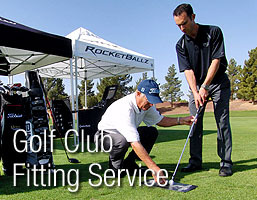 Golf Club Fitting from Golf City Sports’ Professional, Mario Luca, can improve your game. Golf club fitting is always about tailoring the specifications of each golf club to its owner, so they best match the various swing characteristics of each different golfer. We are currently carrying out Custom club fittings at the Driving range at El Paraiso Golf Club, just a short drive from the Golf City shop. The facilities are excellent there, with a grass hitting area, plus covered bays if needed. Next time you head to the driving range when most of the hitting stations are in use, stop and look at the differences in how all the different golfers swing at the ball. Inside-out/square/outside-in swing path – fast/medium/slow swing speed – hitting down/swinging level/hitting up on the ball – forceful, aggressive to average to smooth, slower swing tempo – slice/straight/hook the ball – push/straight/pull the ball – early/midway and late release . . . And on and on. The vast differences in how golfers swing at the ball all translate into a requirement for different golf club fitting specifications for the golfers. This is precisely why the golf industry’s typical business model to build their golf clubs to one series of standard specifications for most of the fitting specifications is so utterly flawed. It is why so many golfers buy golf clubs off the rack and never achieve all they can be as a golfer. Don’t get us wrong, though… Golf club fitting won’t make you a champion overnight, but it will improve your swing and general performance.